Talking journalism at St. Michael High School are, left to right, Joan Levitt, Kimball Begody, Jason Chavez, Crystal Begay, Jayme Biakeddy, Jodie Henderson, MacArthur Jone, Hannah Allison, Kaitlyn Haskie and Cronkite High School Institute Director Anita Luera. Sophomore and junior English classes at St. Michael High School learned about the need for Native journalists on April 29. Anita Luera, director of Arizona State University's Cronkite Institute for High School Journalism, made a presentation, including on-camera interviews with students, which inspired several students to attend an after-school gathering with her for an in-depth discussion. Few high school students today are familiar with the name of Walter Cronkite, who for the second half of the 20th century was the voice of television news. In a recent interview, Luera said, "Having the name of Walter Cronkite to carry on is a rich legacy of journalistic excellence. With this in mind, we strive to offer our students a curriculum and education that embodies the journalistic principles Mr. Cronkite exemplified throughout his journalism careers in newspapers, radio and television news broadcasting." Cronkite visited ASU each year and shared his experiences with journalism students, she said. His words of encouragement always included the vision of journalistic excellence. ASU's Walter Cronkite School of Journalism and Mass Communication and its faculty and staff always strive to meet the changing demands of journalism in the 21st century, she said. While many high school graduates from the Navajo Nation attend ASU, few have applied to ASU's prestigious Cronkite school though that is gradually changing. According to Luera, "The number of Native American journalism students at the Cronkite school has grown over the past three years from less than one percent to over three percent. "Yet this is not enough," she said. "This month Navajo broadcast journalist Colton Shone will graduate with his combined BA and master's degrees in journalism from ASU's Barrett Honors College and the Cronkite school." One reason for the increase in the number of Native journalism students is the Cronkite high school summer program. St. Michael students participated in this program in past years and this summer sophomore Kaitlyn Haskie has been selected to attend. Haskie's strong GPA, keen interest in the world around her, and love of writing led to her apply to the program. Like Haskie, other high school students are considering the world of journalism. Luera visits dozens of high schools throughout the state each semester and was especially inspired by what she heard and saw on a whirlwind trip across Arizona. "Visiting four different high schools on the Hopi and Navajo reservations during the last week gives me new hope for finding future Native American journalists," she said. "Many students have experienced journalism through their school newspaper, radio or yearbook programs," she said. "For others, English classes offer the opportunity to write." Some students love to write, she said, are curious about their world and are interested in going to college. 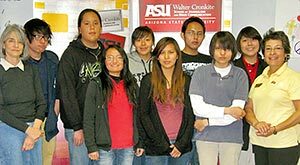 "If these students can understand what a journalism career could mean to their communities and the need to share their stories, we may have a few more students join the ranks of (television) 12 News' Andy Harvey, multimedia independent journalist Patty Talahongva, publisher Tom Arviso and staff members of the Navajo Times and other Native American publications," she said. Luera's energetic presentation is partially a result of her years of experience as a journalist. "My start in journalism started with my studies at ASU," she said. "Upon graduating with my BA in broadcasting, I began working the evening shift in the CBS News affiliate KOOL-TV in Phoenix. "My goal was to learn as much as I could on the job," she said. "Each day brought something new, challenges, successes and failures. "Meeting daily deadlines was a thrill," she said. "I learned the coordinating challenges of working the assignment desk, then the stressful deadline writing and producing for the evening newscasts. After each newscast ended, it would start all over again the next day. There was never a dull moment." St. Michael students were curious about journalism careers. Luera assured them that a journalism degree could lead to careers in newspapers and broadcasting, online journalism, magazine writing and publishing, and sports. "If you visit any professional sporting organization you will find they have journalists working in their communications and broadcasting departments - from running an organization's Web page to managing media coverage of the sports team and access to players. "The number of jobs has grown tremendously," she said. "We have journalists working in government public information offices, joining the teaching ranks, and public relations field." Most major corporations have communications departments, she added, and journalism skills lend themselves to a wide variety of jobs.